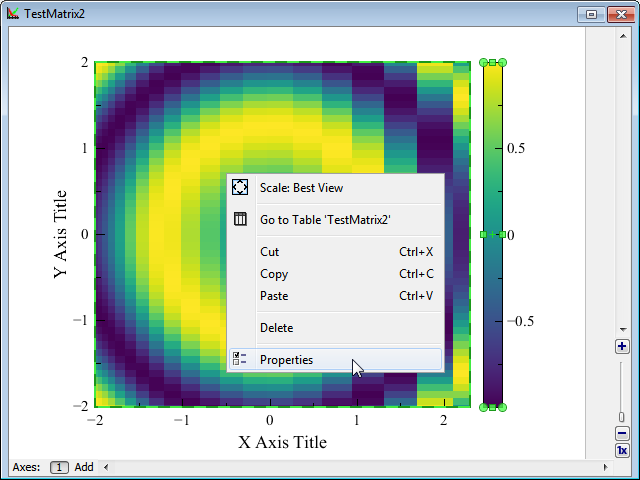 To create a Color Map Plot, open the Table with matrix data, open a context menu and select Create Figure → Color Map item or use Create Figure button on the Toolbar. Color Map Plots are available in Pro edition only. Selection in the table is ignored, the whole table is used for plotting matrix. 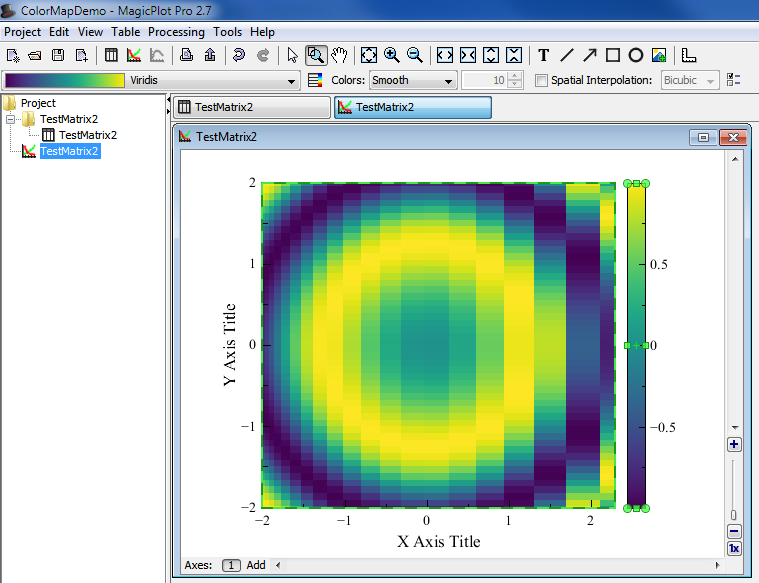 MagicPlot Student edition cannot create Color Map Plots but these plots can be edited in the Student edition if you open a project file which was created in the Pro edition. 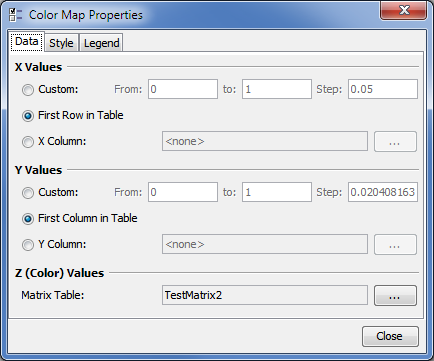 The Color Map Plot can be configured in the Properties dialog which can be opened by double click on the Color Map or using the context menu. The non-uniform (not equally spaced) data in the X/Y columns is supported. The values can also be unsorted. 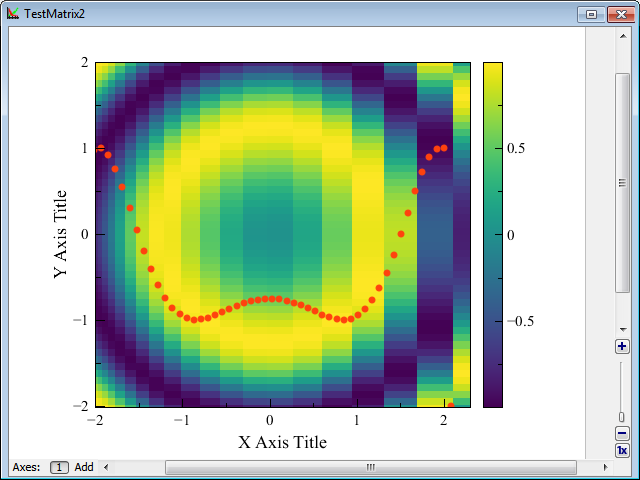 In MagicPlot the Color Map Plot is treated as a generalized 'Curve', so it can be combined on a one Figure with other Curves in the one Axes box. 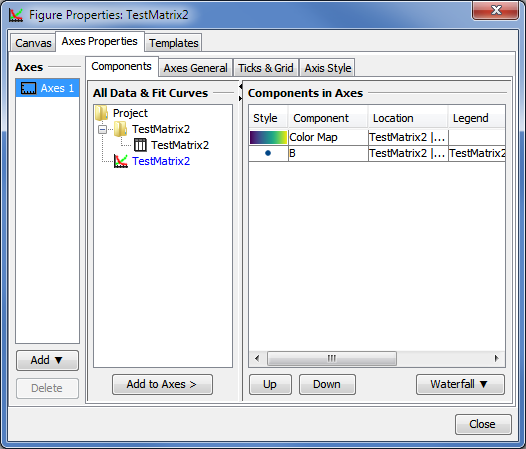 The Color Map Plot is shown in 'Components' list in Figure properties dialog. The drawing sequence can be changed in this list. The axes grid (if it is switched on) is drawn on top of the last (upper) Color Map Plot in the Axes box. You can select, copy and paste Color Map Plots between Figures and Axes boxes as any other Curves. 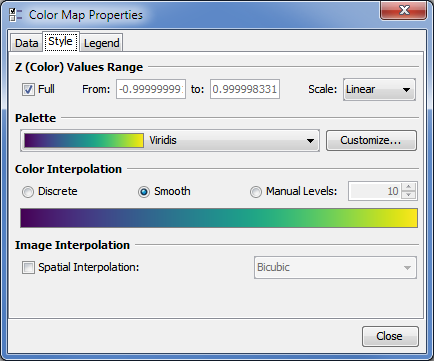 The most often used properties of a Color Map Plot can be changed on the Inspector toolbar (the second row of main window toolbar). The full settings list is available in the Properties dialog which can be opened by double click on the Color Map or from context menu. 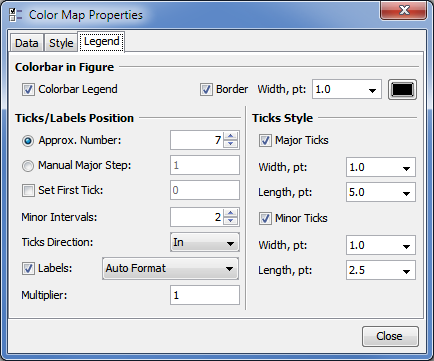 The Color Map palette can be customized by pressing the 'Customize' button on the 'Style' tab of the Color Map properties dialog. Insert Before – inserts a new line before the current selection. The default color and data level values for the new line are calculated as the average of the values from the previous and the next lines. Remove – removes selected lines from table. 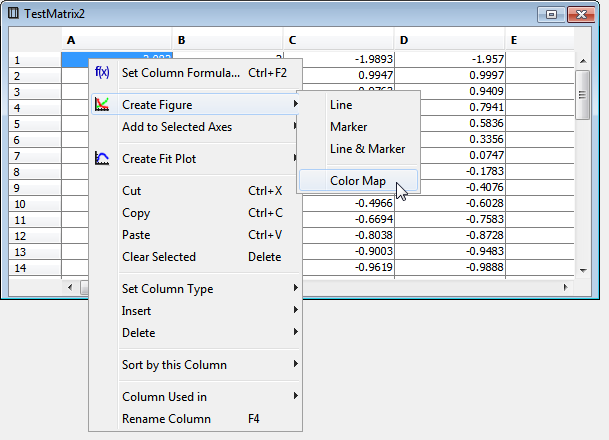 Distribute Evenly – evenly distributes levels and colors in selected lines or in the whole table if less then 3 lines are selected. Invert Sequence – inverts the sequence of colors; the new data levels are calculated as 1-L where L is the initial level value. 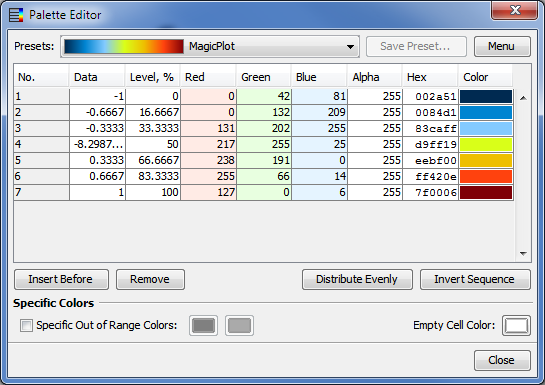 MagicPlot contains several build-in palette presets. 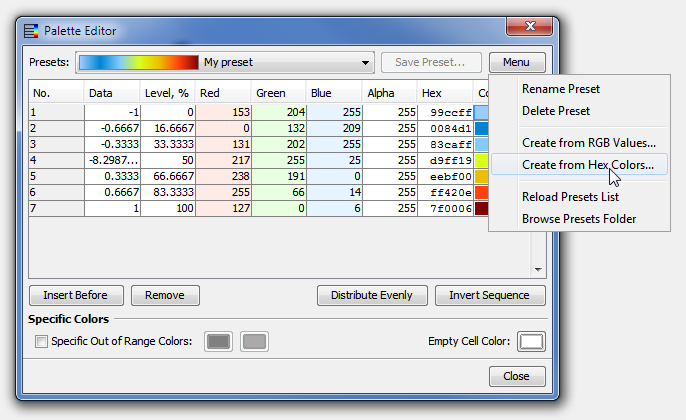 After editing a palette you can also save your own preset by pressing the 'Save Preset' button. The selected preset can be renamed or deleted using 'Menu' button. Custom presets are saved in files with the .mppc extension. You can open the folder which contains custom preset files using the 'Menu' button. Use the 'Reload Presets List' menu item after adding new files in the presets folder. You can import a palette from other applications or text files using the 'Menu' button. 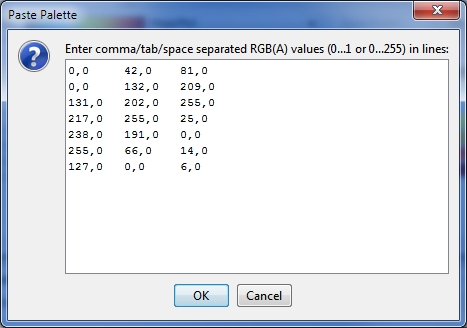 MagicPlot supports RGB values and hexadecimal color codes. The current palette setting will be overridden (this operation can be undone). You can paste red, green, blue values or red, green, blue, alpha values in the opened dialog box. 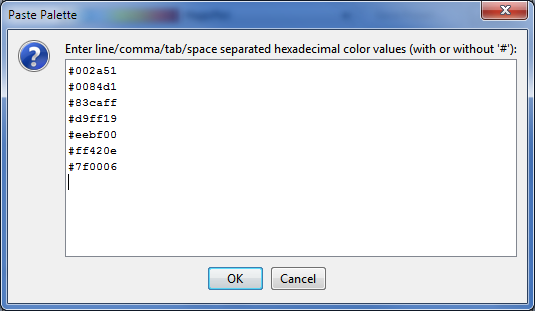 The values must be separated by comma, semicolon, tab or space, one color per line. The both 0…1 and 0.255 values are automatically supported. The comma as a decimal separator is supported only if values are separated by tabs or semicolons. Otherwise the dot only must be used as a decimal separator. Paste hexadecimal color codes in the opened window. The values can be with or without the '#' prefix. The values must be separated by the new line, comma, semicolon, tab or space characters. MagicPlot renders the Color Map Plot as a high-resolution raster image which is included into the vector image file (EPS, PDF, SVG, EMF). Therefore the file size does not depend on the data matrix dimensions. The resolution of the Color Map image is set by the DPI value in the 'Canvas' tab of the Figure properties dialog. The Postscript (EPS) and EMF image format does not support the transparency in the color maps. MagicPlot store palette colors as 4 floating-point numbers (Red, Green, Blue, Opacity). Note that even if color components are represented in 0…255 range, the fractional digits still make sense if smooth color interpolation is selected. In the 'Smooth' and 'Manual Levels' color interpolation modes MagicPlot interpolates colors linearly in the sRGB color space. MagicPlot supports 3 color map spatial interpolation modes: off (nearest neighbor), bilinear and bicubic. MagicPlot performs the bicubic interpolation using the cubic Hermite spline. For uniform (equally spaced) x or y values this method is equal to the conventional bicubic interpolation algorithm (which is widely used for the image resizing) with the coefficient a=-0.5.